【Portable Well-built Lantern】 Small, compact and lightweight, this lantern will be a perfect companion for camping, hiking fishing etc. 【Extendable Design】 You can turn off the light by contracting the lantern, or turn it on by just pulling up on the handle (light up automatically). Contract it to a smaller size for easy storage. 【Soft Super Brightness】 This lantern has 146lumen with 50,000 hours long lifespan. Its bulb-like lampshade with double layer makes the light to be more soft and concentrated. 【Durable Superior Material】 This water-proof lantern adopts durable ABS material which can be used indoors or outdoors. Also, it can light up to 12 continuous hours with 6 new AA batteries. 【Detachable & Foldaway Stainless Handles】 The durable steel handles help to hang or carry the lantern easily. This pretty cool little LED lantern was designed in smooth elegant cylinder shape which represents the attitude towards a simple, fashionable modern lifestyle. The lantern is built for both the indoors & outdoors. You can take this portable bright lantern as an emergency light, camping lantern, or just for decoration as you wish. The little size of this LED lantern makes it easy to travel with and also compact enough to store in your backpack. This LED lantern is made with no switch. You just need to pull the handle up to turn on the light, or collapse the lantern to switch off. 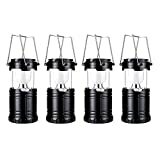 The durable steel handles helps to hang or carry the lantern easily. It comes with a clip so you can hang it on the tent as a flashlight while camping. This would work great in power outages if you have batteries installed in it. The camping light has 6LED bulbs with 146lumen which is very bright and the handles are easy to hold onto. And you could find the included 3 AA batteries in the package.